The triple star crowning acrylic award is a great way to show any recipient that they are a star. Not just a star, but a triple star. An Exellent patriotic award. 7" x 10" x 3/4"
Clear acrylic award, 3/4" thick with 3 star knockout provides depth and dimensions. Available in two different sizes, laser engraved to a frosted white text. Presentation Box included. Image shown with full color imprinting, available as an optional imprinting method to this acrylic award. 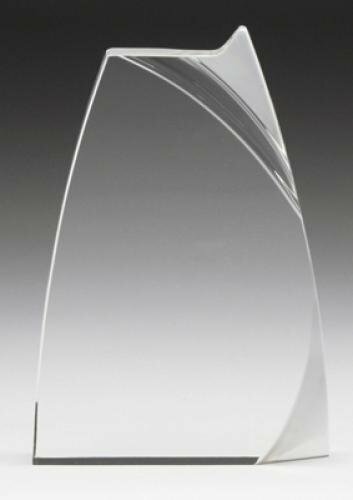 Elegant is the only term that one can use when describing these 1" thick Triumph Acrylic Awards. Each piece has a unique cut pattern at the top and sides providing a unique look while leaving a large engraving or laserable area that can accommodate any of your personalization needs. Flexibility is a key component for these awards as they are offered in Clear and your choice of three sizes 6", 7", or 8" tall. A white presentation box completes these fine awards that anyone would be proud to give or receive. A celebration of color and vibrancy is what you get with this award made of a platinum sculpture with multi-colored Art Glass and a black marble base. Pure K9 premium optic crystal trophy cup. Great as sport trophies. Available in three sizes. The Trophy Cup Acrylic Award is beautifully crafted from clear acrylic. It features bevels on both sides to create a beautiful effect. It's traditional trophy cup shape and design makes it perfect for any occasion! Your choice of clear or black base is included. Available in two sizes. Your choice of blue, red, green or purple painted edge. 5-1/2" wide x 8" high x 1" thick. 8" wide x 11" high x 1-1/4" thick. Keep on trucking with this AcraLaser Truck. 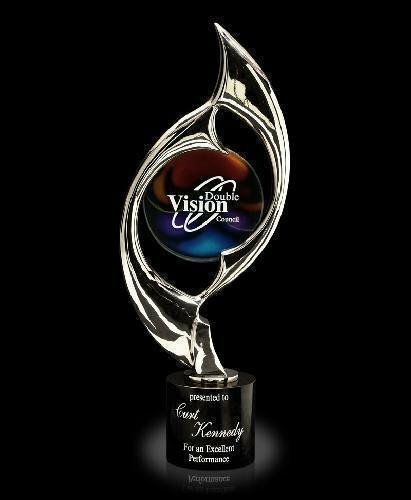 Laser engrave your company's name and deliver a fun acrylic award. Perfect corporate gift or award to honor ones that goes the extra mile.